"Jagiełło" and "Jagiello" redirect here. For other uses, see Jagiełło (disambiguation). For monarchs with similar names, see Ladislaus Jagiello (disambiguation) and Ladislaus. Jogaila ( Jogaila), later Władysław II Jagiełło (Polish pronunciation: [vwaˈdɨswaf jaˈɡʲɛwːɔ] ( listen))[nb 1] (c. 1352/1362 – 1 June 1434) was the Grand Duke of Lithuania (1377–1434) and then the King of Poland (1386–1434), first alongside his wife Jadwiga until 1399, and then sole King of Poland. He ruled in Lithuania from 1377. Born a pagan, in 1386 he converted to Catholicism and was baptized as Władysław in Kraków, married the young Queen Jadwiga, and was crowned King of Poland as Władysław II Jagiełło. In 1387 he converted Lithuania to Christianity. His own reign in Poland started in 1399, upon the death of Queen Jadwiga, and lasted a further thirty-five years and laid the foundation for the centuries-long Polish–Lithuanian union. He was a member of the Jagiellonian dynasty in Poland that bears his name and was previously also known as the Gediminid dynasty in the Grand Duchy of Lithuania. The dynasty ruled both states until 1572,[nb 2] and became one of the most influential dynasties in late medieval and early modern Central and Eastern Europe. During his reign, the Polish-Lithuanian state was the largest state in the Christian world. Jogaila was the last pagan ruler of medieval Lithuania. After he became King of Poland, as a result of the Union of Krewo, the newly formed Polish-Lithuanian union confronted the growing power of the Teutonic Knights. The allied victory at the Battle of Grunwald in 1410, followed by the Peace of Thorn, secured the Polish and Lithuanian borders and marked the emergence of the Polish–Lithuanian alliance as a significant force in Europe. The reign of Władysław II Jagiełło extended Polish frontiers and is often considered the beginning of Poland's Golden Age. Little is known of Jogaila's early life, and even his year of birth is uncertain. Previously historians assumed he was born in 1352, but some recent research suggests a later date—about 1362. He was a descendant of the Gediminid dynasty and was the son of Algirdas, Grand Duke of Lithuania, and his second wife, Uliana of Tver. The Grand Duchy of Lithuania to which Jogaila succeeded as Grand Duke in 1377 was a political entity composed of two leading, but very different nationalities and two political systems: ethnic Lithuania in the north-west and the vast Ruthenian territories of former Kievan Rus', comprising the lands of modern Ukraine, Belarus, and parts of western Russia. At first, Jogaila—like his father—based his rule in the southern and eastern territories of Lithuania, while his uncle, Kęstutis, the Duke of Trakai, continued to rule the north-western region. [nb 3] Jogaila's succession, however, soon placed this system of dual rule under strain. At the start of his reign, Jogaila was preoccupied with unrest in the Lithuanian Rus' lands. In 1377–78, Andrei of Polotsk, the eldest son of Algirdas, challenged Jogaila's authority and sought to become Grand Duke. In 1380, Andrei and another brother, Dmitry, sided with Prince Dmitri of Moscow against Jogaila's alliance with emir Mamai, de facto khan of the Golden Horde. Jogaila failed to support Mamai, lingering in the vicinity of the battlefield, which led to Mamai's army's significant defeat at the hands of Prince Dmitri in the Battle of Kulikovo. The Muscovites' Pyrrhic victory over the Golden Horde, in the long term, signified, however, the beginning of a slow climb to power by the Grand Duchy of Moscow, which became within a century the most serious rival and threat to the integrity, well-being and survival of Lithuania. However, in 1380 Muscovy was greatly weakened by tremendous losses suffered during the battle and thus, in the same year, Jogaila was free to begin a struggle for supremacy with Kęstutis. In the north-west, Lithuania faced constant armed incursions from the Teutonic Knights—founded after 1226 to fight and convert the pagan Baltic tribes of Prussians, Yotvingians and Lithuanians. In 1380, Jogaila concluded the secret Treaty of Dovydiškės, directed against Kęstutis. When Kęstutis discovered the plan, the Lithuanian Civil War began. He seized Vilnius, overthrew Jogaila, and pronounced himself grand duke in his place. In 1382, Jogaila raised an army from his father's vassals and confronted Kęstutis near Trakai. Kęstutis and his son Vytautas entered Jogaila's encampment for negotiations but were tricked and imprisoned in the Kreva Castle, where Kęstutis was found dead, probably murdered, a week later. Vytautas escaped to the Teutonic fortress of Marienburg and was baptised there under the name Wigand. Jogaila formulated the Treaty of Dubysa, which rewarded the Knights for their aid in defeating Kęstutis and Vytautas by promising Christianisation and granting them Samogitia west of the Dubysa river. However, when Jogaila failed to ratify the treaty, the Knights invaded Lithuania in the summer of 1383. In 1384, Jogaila reconciled with Vytautas promising to return his patrimony in Trakai. Vytautas then turned against the Knights, attacking and looting several Prussian castles. Jogaila's Russian mother Uliana of Tver urged him to marry Sofia, daughter of Prince Dmitri of Moscow, who required him first to convert to Orthodoxy. [nb 4] That option, however, was unlikely to halt the crusades against Lithuania by the Teutonic Knights, who regarded Orthodox Christians as schismatics and little better than heathens. Jogaila chose therefore to accept a Polish proposal to become a Catholic and marry the eleven-year-old Queen Jadwiga of Poland. [nb 5] The nobles of Lesser Poland made this offer to Jogaila for many reasons. They wanted to neutralize the dangers posed by Lithuania itself and to secure the fertile territories of Galicia–Volhynia. The Polish nobles saw the offer as an opportunity for increasing their privileges and avoiding Austrian influence, brought by Jadwiga's previous fiancé William, Duke of Austria. Jogaila was duly baptised at the Wawel Cathedral in Kraków on 15 February 1386 and from then on formally used the name Władysław or Latin versions of it. [nb 7] The marriage took place three days later, and on 4 March 1386 Jogaila was crowned King Władysław by archbishop Bodzanta. He was also to be legally adopted by Jadwiga's mother, Elizabeth of Bosnia, so retaining the throne in the event of Jadwiga's death. The royal baptism triggered the conversion of most of Jogaila's court and noblemen, as well as mass baptisms in Lithuanian rivers, a beginning of the final Christianization of Lithuania. Though the ethnic Lithuanian nobility were the main converts to Catholicism—both paganism and the Orthodox rite remained strong among the peasants—the king's conversion and its political implications created lasting repercussions for the history of both Lithuania and Poland. Władysław II Jagiello and Queen Jadwiga reigned as co-monarchs; and though Jadwiga probably had little real power, she took an active part in Poland's political and cultural life. In 1387, she led two successful military expeditions to Red Ruthenia, recovered lands her father Louis I of Hungary had transferred from Poland to Hungary, and secured the homage of Petru I, Voivode of Moldavia. In 1390, she also personally opened negotiations with the Teutonic Order. Most political responsibilities, however, fell to Jagiello, with Jadwiga attending to the cultural and charitable activities for which she is still revered. Soon after Jagiello's accession to the Polish throne, Jagiello granted Vilnius a city charter like that of Kraków, modeled on the Magdeburg Law; and Vytautas issued a privilege to a Jewish commune of Trakai on almost the same terms as privileges issued to the Jews of Poland in the reigns of Boleslaus the Pious and Casimir the Great. Władysław's policy of unifying the two legal systems was partial and uneven at first but achieved a lasting influence. By the time of the Union of Lublin in 1569, there was not much difference between the administrative and judicial systems in force in Lithuania and Poland. One effect of Jagiello's measures was to be the advancement of Catholics in Lithuania at the expense of Orthodox elements; in 1387 and 1413, for example, Lithuanian Catholic boyars were granted special judicial and political privileges denied to the Orthodox boyars. As this process gained momentum, it was accompanied by the rise of both Rus' and Lithuanian identity in the fifteenth century. Jagiello's baptism failed to end the crusade of the Teutonic Knights, who claimed his conversion was a sham, perhaps even a heresy, and renewed their incursions on the pretext that pagans remained in Lithuania. From then on, however, the Order found it harder to sustain the cause of a crusade and faced the growing threat to its existence posed by the Kingdom of Poland and a genuinely Christian Lithuania alliance. Władysław sponsored the creation of the diocese of Vilnius under bishop Andrzej Wasilko, the former confessor of Elisabeth of Hungary. The bishopric, which included Samogitia, then largely controlled by the Teutonic Order, was subordinated to the see of Gniezno and not to that of Teutonic Königsberg. The decision may not have improved Władysław's relations with the Order, but it served to introduce closer ties between Lithuania and Poland, enabling the Polish church to freely assist its Lithuanian counterpart. In 1389, Władysław's rule in Lithuania faced a revived challenge from Vytautas, who resented the power given to Skirgaila in Lithuania at the expense of his own patrimony. Vytautas started a civil war in Lithuania, aiming to become the Grand Duke. On 4 September 1390, the joint forces of Vytautas and the Teutonic Grand Master, Konrad von Wallenrode, laid siege to Vilnius, which was held by Władysław's regent Skirgaila with combined Polish, Lithuanian and Ruthenian troops. Although the Knights lifted the siege of the castle after a month, they reduced much of the outer city to ruins. This bloody conflict was eventually brought to a temporary halt in 1392 with the Treaty of Ostrów, by which Władysław handed over the government of Lithuania to his cousin in exchange for peace: Vytautas was to rule Lithuania as the Grand Duke (magnus dux) until his death, under the overlordship of the Supreme Duke (dux supremus) in the person of the Polish monarch. Skirgaila was moved from the Duchy of Trakai to become prince of Kiev. Vytautas initially accepted his status but soon began to pursue Lithuania's independence from Poland. The protracted period of war between the Lithuanians and the Teutonic Knights was ended on 12 October 1398 by the Treaty of Salynas, named after the islet in the Neman River where it was signed. Lithuania agreed to cede Samogitia and assist the Teutonic Order in a campaign to seize Pskov, while the Order agreed to assist Lithuania in a campaign to seize Novgorod. Shortly afterwards, Vytautas was crowned as a king by local nobles; but the following year his forces and those of his ally, Khan Tokhtamysh of the White Horde, were crushed by the Timurids at the Battle of the Vorskla River, ending his imperial ambitions in the east and obliging him to submit to Władysław's protection once more. On 22 June 1399, Jadwiga gave birth to a daughter, baptised Elizabeth Bonifacia, but within a month the mother and daughter died, leaving Władysław sole ruler of the Kingdom of Poland and without an heir nor much legitimacy to rule the kingdom. Jadwiga's death undermined Władysław's right to the throne, and as a result old conflicts between the nobility of Lesser Poland, generally sympathetic to Władysław, and the gentry of Greater Poland began to surface. In 1402, Władysław answered the rumblings against his rule by marrying Anna of Celje, a granddaughter of Casimir III of Poland, a political match that re-legitimised his reign. The Union of Vilnius and Radom of 1401 confirmed the status of Vytautas as grand duke under Władysław's overlordship, while assuring the title of grand duke to the heirs of Władysław rather than those of Vytautas: should Władysław die without heirs, the Lithuanian boyars were to elect a new monarch. Since no heir had yet been produced by either monarch, the implications of the union were unforeseeable, but it forged bonds between the Polish and Lithuanian nobility and a permanent defensive alliance between the two states, strengthening Lithuania's hand for a new war against the Teutonic Order in which Poland officially took no part. 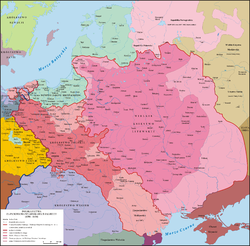 While the document left the liberties of the Polish nobles untouched, it granted increased power to the boyars of Lithuania, whose grand dukes had till then been unencumbered by checks and balances of the sort attached to the Polish monarchy. The Union of Vilnius and Radom therefore earned Władysław a measure of support in Lithuania. The war ended in the Treaty of Raciąż on 22 May 1404. Władysław acceded to the formal cession of Samogitia and agreed to support the Order's designs on Pskov; in return, Konrad von Jungingen undertook to sell Poland the disputed Dobrzyń Land and the town of Złotoryja, once pawned to the Order by Władysław Opolski, and to support Vytautas in a revived attempt on Novgorod. Both sides had practical reasons for signing the treaty at that point: the Order needed time to fortify its newly acquired lands, the Poles and Lithuanians to deal with territorial challenges in the east and in Silesia. Meanwhile, both sides unleashed diplomatic offensives. The Knights dispatched letters to the monarchs of Europe, preaching their usual crusade against the heathens; Władysław countered with his own letters to the monarchs, accusing the Order of planning to conquer the whole world. Such appeals successfully recruited many foreign knights to each side. Wenceslas IV of Bohemia signed a defensive treaty with the Poles against the Teutonic Order; his brother, Sigismund of Luxembourg, allied himself with the Order and declared war against Poland on 12 July, though his Hungarian vassals refused his call to arms. When the war resumed in June 1410, Władysław advanced into the Teutonic heartland at the head of an army of about 20,000 mounted nobles, 15,000 armed commoners, and 2,000 professional cavalry mainly hired from Bohemia. After crossing the Vistula over the pontoon bridge at Czerwińsk, his troops met up with those of Vytautas, whose 11,000 light cavalry included Lithuanians, Ruthenians, and Tatars. The Teutonic Order's army numbered about 18,000 cavalry, mostly Germans, and 5,000 infantry. On 15 July, at the Battle of Grunwald after one of the largest and most ferocious battles of the Middle Ages, the allies won a victory so overwhelming that the Teutonic Order's army was virtually annihilated, with most of its key commanders killed in combat, including Grand Master Ulrich von Jungingen and Grand Marshal Friedrich von Wallenrode. Thousands of troops were reported to have been slaughtered on either side. The road to the Teutonic capital Marienburg now lay open, the city undefended; but for reasons the sources do not explain, Władysław hesitated to pursue his advantage. On 17 July, his army began a laboured advance, arriving at Marienburg only on 25 July, by which time the new Grand Master, Heinrich von Plauen, had organised a defence of the fortress. The apparent half-heartedness of the ensuing siege, called off by Władysław on 19 September, has been ascribed variously to the impregnability of the fortifications, to high casualty figures among the Lithuanians, to Władysław's unwillingness to risk further casualties, or to his desire to keep the Order weakened but undefeated as to not upset the balance of power between Poland (which would most likely acquire most of the Order possessions if it was totally defeated) and Lithuania; but a lack of sources precludes a definitive explanation. 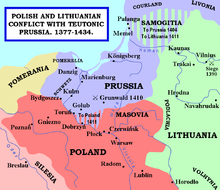 The war ended in 1411 with the Peace of Thorn, in which neither Poland nor Lithuania drove home their negotiating advantage to the full, much to the discontent of the Polish nobles. Poland regained Dobrzyń Land, Lithuania regained Samogitia, and Masovia regained a small territory beyond the Wkra river. Most of the Teutonic Order's territory, however, including towns that had surrendered, remained intact. Władysław then proceeded to release many high-ranking Teutonic Knights and officials for apparently modest ransoms. The cumulative expense of the ransoms, however, proved a drain on the Order's resources. This failure to exploit the victory to his nobles' satisfaction provoked growing opposition to Władysław's regime after 1411, further fuelled by the granting of Podolia, disputed between Poland and Lithuania, to Vytautas, and by the king's two-year absence in Lithuania. The Council of Constance proved a turning point in the Teutonic crusades, as it did for several European conflicts. Vytautas sent a delegation in 1415, including the metropolitan of Kiev and Samogitian witnesses; they arrived at Constance at the end of that year to express their preference for being "baptised with water and not with blood". The Polish envoys, among them Mikołaj Trąba, Zawisza Czarny, and Paweł Włodkowic, lobbied for an end to the forced conversion of heathens and to the Order's aggression against Lithuania and Poland. As a result of the Polish–Lithuanian diplomacy, the council, though scandalised by Włodkowic's questioning of the legitimacy of the monastic state, denied the Order's request for a further crusade and instead entrusted the conversion of the Samogitians to Poland–Lithuania. The diplomatic context at Constance included the revolt of the Bohemian Hussites, who looked upon Poland as an ally in their wars against Sigismund, the emperor elect and new king of Bohemia. In 1421, the Bohemian Diet declared Sigismund deposed and formally offered the crown to Władysław on condition that he accept the religious principles of the Four Articles of Prague, which he was not prepared to do. After Władysław's refusal, Vytautas was postulated (elected in absentia) as Bohemian king, but he assured the pope that he opposed the heretics. Between 1422 and 1428, Władysław's nephew, Sigismund Korybut, attempted a regency in war-torn Bohemia, with little success. Vytautas accepted Sigismund's offer of a royal crown in 1429 — apparently with Władysław's blessing — but Polish forces intercepted the crown in transit and the coronation was cancelled. In 1422, Władysław fought another war, known as the Gollub War, against the Teutonic Order, defeating them in under two months before the Order's imperial reinforcements had time to arrive. The resulting Treaty of Melno ended the Knights' claims to Samogitia once and for all and defined a permanent border between Prussia and Lithuania. Lithuania was given the province of Samogitia, with the port of Palanga, but the city of Klaipėda was left to the Order. This border remained largely unchanged for roughly 500 years, until 1920. The terms of this treaty have, however, been seen as turning a Polish victory into defeat, as a result of Władysław's renunciation of Polish claims to Pomerania, Pomerelia, and Chełmno Land, for which he received only the town of Nieszawa in return. The Treaty of Melno closed a chapter in the Knights' wars with Lithuania but did little to settle their long-term issues with Poland. Further sporadic warfare broke out between Poland and the Knights between 1431 and 1435. Władysław's second wife, Anna of Celje, had died in 1416, leaving a daughter, Jadwiga. In 1417, Władysław married Elisabeth of Pilica, who died in 1420 without bearing him a child, and two years later, Sophia of Halshany (niece of Uliana Olshanska), who bore him two surviving sons. The death in 1431 of his daughter Jadwiga, the last heir of Piast blood, released Władysław to make his sons by Sophia of Halshany his heirs, though he had to sweeten the Polish nobles with concessions to ensure their agreement, since the monarchy was elective. During an excursion into Przemyśl Land in the 48th year of his reign, Władysław caught a cold from which he was unable to recover. He finally died in Grodek in 1434, leaving Poland to his elder son, Władysław III, and Lithuania to his younger, Casimir, both still minors at the time. The Lithuanian inheritance, however, could not be taken for granted. Władysław's death ended the personal union between the two realms, and it was not clear what would take its place. ^ He is known under a number of names: Lithuanian: Jogaila Algirdaitis; Polish: Władysław II Jagiełło; Belarusian: Jahajła (Ягайла). See also: Names and titles of Władysław II Jagiełło. ^ Anna Jagiellon, the last member of royal Jagiellon family, died in 1596. ^ The historian John Meyendorff suggests Jogaila may have already been an Orthodox Christian: "In 1377, Olgerd of Lithuania died, leaving the Grand Principality to his son Jagiello, an Orthodox Christian..." (Meyendorff 1989, p. 205). Dmitri, however, made it a condition of the marriage that Jogaila "should be baptized in the Orthodox faith and that he should proclaim his Christianity to all men" (Dvornik 1992, p. 221). ^ Jadwiga had actually been crowned king of Poland (rex poloni), because the Polish political system made no provision for a queen regnant Stone 2001, p. 8). ^ A Slavic name that roughly translates as glorious rule, Władysław is often Latinised into either Wladislaus or Ladislaus. The choice evoked both Władysław I of Poland, the Elbow-high, who was Queen Jadwiga's great-grandfather and unified the kingdom in 1320, and Saint Ladislaus I of Hungary, a king who sided with the pope against the emperor Henry IV and Christianised Transylvania (Rowell 2000, pp. 709–712). 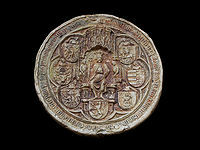 Wikimedia Commons has media related to Wladislaus II of Poland. This page was last edited on 8 January 2019, at 04:57 (UTC).